After an exciting opening encounter 10 days ago that almost saw the province record a shock opening day victory, they'll be pushing hard to get that first win in their second home game at the Mardyke Cricket Grounds. Once again the squad features several Munster players, though with several more unavailable, once again members of the Cricket Ireland National Academy will be proudly representing the Reds, and the group will undoubtedly be fired up after a narrow 9 run defeat on Duckworth Lewis after bad light stopped play against the Northern Knights. Stephan Grobler again captains the squad, fresh off a three-wicket haul in the last game. Jack Tector made 59 in that Knights game, and will feature in the batting order once again. Fit-again David Delany comes into the squad to replace Aaron Cawley, back in England to continue his scholarship. There is also a straight swap in Cork County personnel, as Morne Bauer comes in to replace Muhammad Saddique, and provide extra firepower to the batting lineup. Munster Reds Squad to face North-West Warriors: Stephan Grobler capt. (Cork County), David Delany (National Academy/Clontarf), Gary King (Cork County), Morne Bauer (Cork County), Yaqoob Ali (Co Kerry), Robert Forrest (Clontarf), Nicolaas Pretorius (Phoenix), Rory Anders (National Academy/Phoenix), Jamie Grassi (National Academy/North County), Max Neville (National Academy/Merrion), Harry Tector (National Academy/YMCA), Jack Tector (National Academy/YMCA). 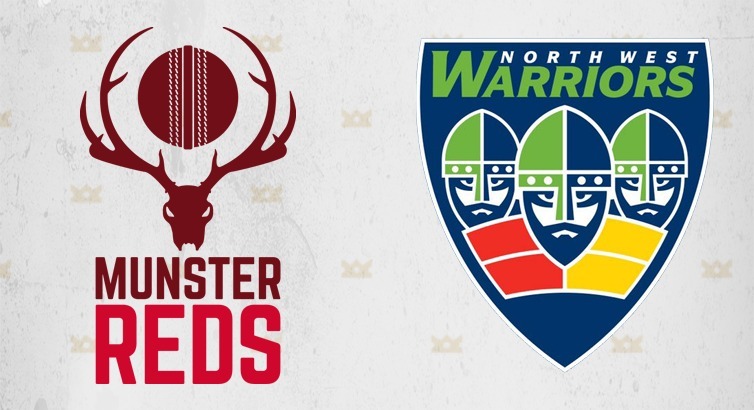 Munster Reds v North-West Warriors, Mardyke, Friday June 9th, 5pm.